Before we go into the giveaway details, I have to tell you a bit about this fantastic laundry. Before we moved onto our plot, laundry was already an issue for us. Our top-loader washing machine uses an embarrassing amount of water. Once we were restricted to Cape Town’s drought water restrictions of 50 litres per person per day, we were in trouble. I worked out that if I managed to cut our laundry down to ten loads a month (for four people), we’d be using about a third of our monthly allocation. After a hard day of work, Kevin and Louis’ clothes are extremely dirty and full of shards of metal, grease, sawdust, cement, glue, etc (aka “man glitter” as Kevin likes to call it) and impossible to wash by hand. Also, such dirty work meant no skipping their two minute showers either. At that time, fellow Cape Town residents were bragging about how little water they were using. I guessed that they were reaching their impossibly low figures by buying all their drinking water (a terrible solution for our landfills and the plastic crisis), and sending their laundry to a laundromat. Obviously, using someone else’s water to wash your clothes doesn’t really help Cape Town’s situation. I could find no information on how much water an industrial washing machine uses per kilogram of laundry in comparison to a standard household top-loader. So, I wasn’t keen on this idea. Cape Town residents: they collect and deliver for free (minimum 10kgs). I have been using Green Planet Laundry since the 50-litres-per-person-per-day water restriction was put in place. I couldn’t be happier with the service they have provided me. Now that we are living on a plot, and my laundry issues are even more complicated, I am extremely grateful for the service that they provide. Every second week, I send in about 15kgs of laundry. The next day our clothes are returned to me, by one of their friendly drivers, smelling and looking much better. The dirty work clothes are definitely looking cleaner now, compared to when I was washing them in a standard household top-loader washing machine. Laundry is always collected and delivered in its own private bag. Here it is ready to go! Green Planet Laundry, in all this time, haven’t as much as lost a dishcloth of ours. They have not complained about the terrible state of the clothes I send in (seriously friends, our laundry is horrendous), and if they are concerned about anything, such as a particular stain, they are quick to phone me to discuss the issue. Have I praised them enough? 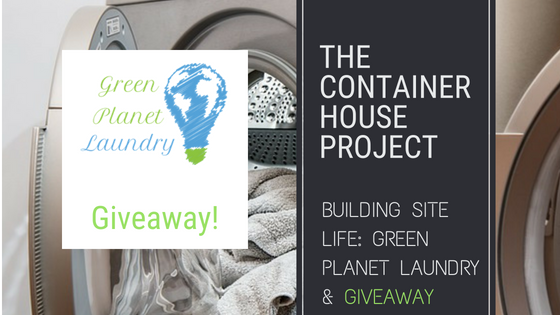 Well, if you’re still not convinced, here’s your chance to win a voucher to have your own laundry cleaned by Green Planet Laundry. Who wouldn’t want a break from the tedium of dirty clothes? If you don’t personally do your laundry, perhaps you’d like to win the voucher for someone close to you. Don’t forget to share the competition on your social media accounts to obtain extra entries. You can stand a chance to win a once off Green Planet Laundry wash/dry/iron/fold voucher that includes collection/delivery for laundry up to 20kgs. The value of this voucher is approximately R850. Please note that Green Planet Laundry are based in Cape Town and collection/delivery only takes place in the greater Cape Town Area (from Strand to Paarl to Duynefontein to Cape Point). Update 12 November 2018: Green Planet Laundry are no longer offering a free collection and delivery service for domestic laundry due to the increasing petrol prices and reduction of water restrictions in Cape Town. They are currently focusing their efforts on commercial laundry (eg, the hospitality industry).